Hello friends! I get asked often about making cards for guys. I naturally tend to create with feminine colors and organic lines and textures but sometimes you need to make a card outside of your normal style (usually when a male relative has a birthday.) I think we don’t often make cards for our men because (and this is going to sound really sexist so I apologize in advance) because we don’t think they will appreciate them while our girlfriends will gush over the glitter, hand stitching and our awesome copic coloring skills…OK I imagine my girlfriends opening my cards and fainting with pleasure over the joy of receiving one of my handmade creations, but I might be delusional. Anyway, today I’m going to show you how to make this card. 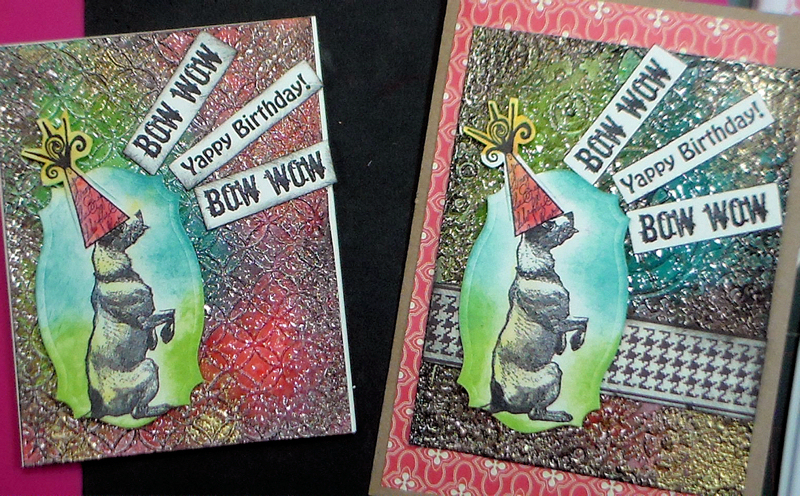 Dog and Party Hat stamps from Lost Coast Designs. Colors, stick with blue, green, red, brown and black, if you are feeling sassy you can add orange to the mix! Texture, look for diamond plate or gear/cog embossing folders, if you don’t have any you can run the card over a few times with your car. 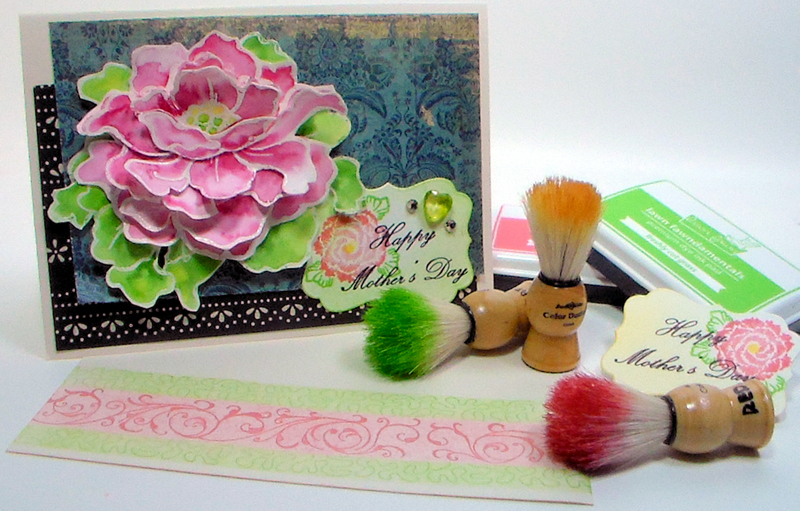 Any Tim Holtz embellishment is appropriate for a man card. I know it can be hard to part with a precious TH embellie but you can probably steal back the embellishment later after he forgets about the card. Add a clearly defined sentiment in case he does not realize what the card is for. All joking aside making cards for guys is as simple as shifting your color palette and going with texture over embellishments:) And I didn’t mean to be harsh on the guys, I have just heard from so many of my stamping girlfriends say that their guys did not SEEM to really appreciate their handmade cards. But I don’t really appreciate the finesse of a football player kicking a touchdown thingie and that is OK as long as we appreciate that it makes the other person happy and we support it. That’s my opinion:) Thanks for stopping by and til next time happy crafting! Hi friends! 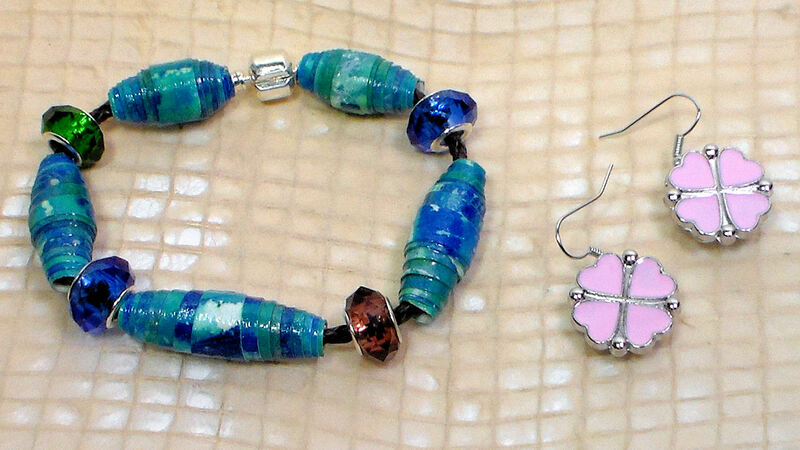 I got a chance to try out the snap on jewelry components and European style beads and bracelets from PandaHall. 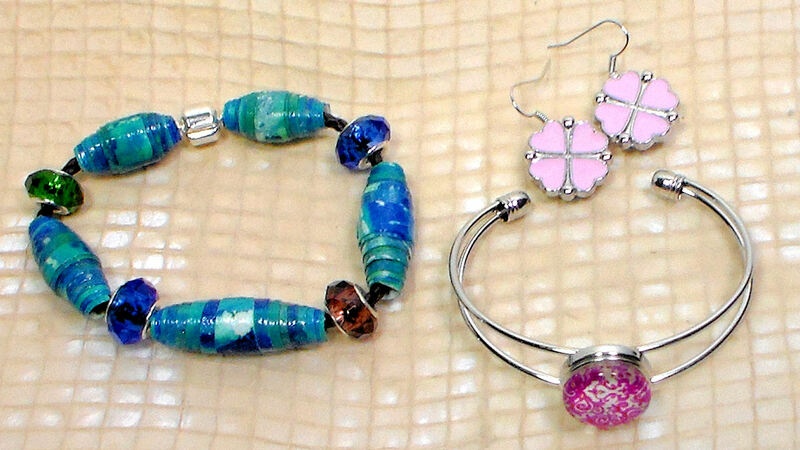 They are a quick and easy way to make quick and fun earrings, bracelets and other fashionable items but being a DIY girl I wanted to see how I could make them work with some paper beads. I have the tendency to go on a bead making spree and them put them in a box never to be used. I thought this would be the perfect project for them because if I change my mind it is easy to take the almost instant jewelry apart and make something else with it! Watch this quick video to see how I made these! I have to mention that this is the only time I have tried decorative snaps for jewelry making so I do not know if they will stay snapped tight forever, you can unsnap them (like a shirt) but I do not know how much wear and tear they can take before becoming loose. Also the snaps come in different sizes (the ones on the earrings were smaller than the bracelet) so make sure you are buying the right size snaps for your project. If the glitzy faceted beads I used are not your thing you should check out the beautiful lampwork and gemstone large holed beads that are really affordable. I know many of you have been frustrated with the shipping costs at PandaHall so I am happy to report that they opened up a USA Amazon and UK Amazon store so you can order their most popular items and get free shipping! 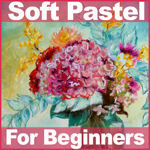 Thanks to PandaHall for sponsoring this post, thank YOU for stopping by and til next time happy crafting! Hi friends! 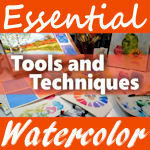 I have been asked by countless readers to create a video explaining acrylics mediums and I finally got it done! I know it’s a lot to remember so I made a printable chart for you. 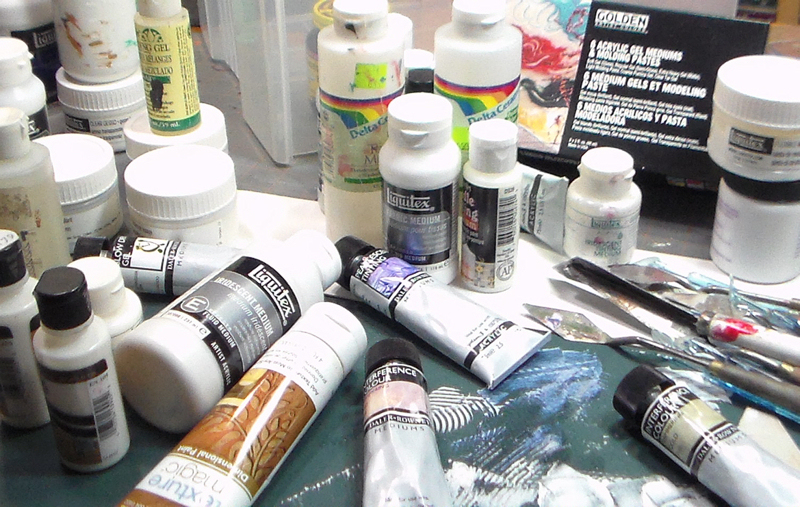 And now, the moment you have been waiting for, the acrylic mediums 101 video! I hope you found this helpful. Please share this post with your friends via social media, there are handy links for Pintrest, Facebook, Twitter and others below. I enjoyed making the video and printable chart and I want it to help as many people as possible. Let me know what you think or if you have any questions in the comments below and til next time happy crafting! Hi friends! I had a very productive day, I finally filmed the acrylic mediums video I have been promising and with any luck it will finishing uploading to you tube sometime in the near future LOL! 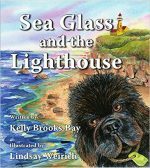 It has been stuck in limbo for hours and I am so excited to share it with you! But for now I will share with you my secret for coming up with good ideas for projects. So, how do YOU come up with new ideas? Let me know in the comments below and til next time happy crafting! Hi Friends! 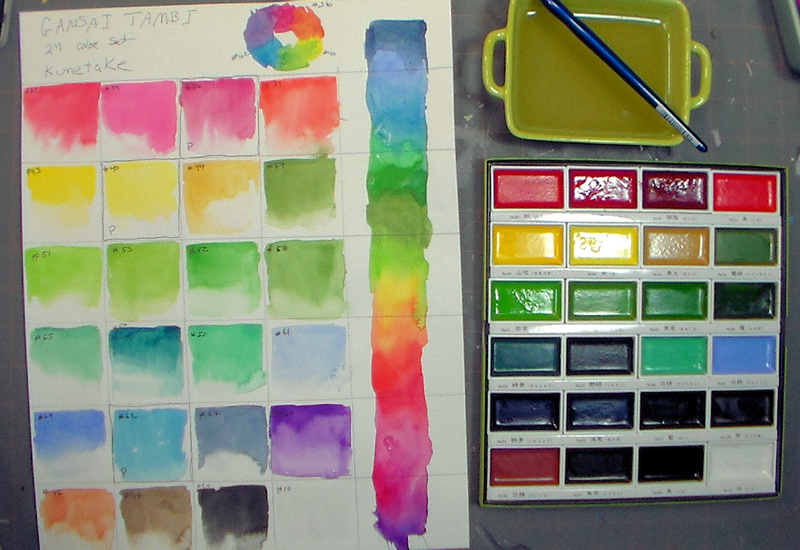 I have been asked so many times to review the new KURETAKE Gansai Tambi Water Colours Set so as soon as Hallmark Scrapbook got some in stock I tried them out! 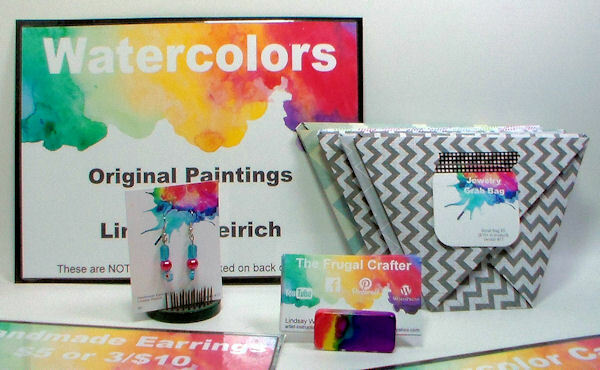 Crafters have been super excited to get their hands on these because of their rich vibrant color palette and ease of use. See what I think of them in this video. I really like how this layered flower turned out. 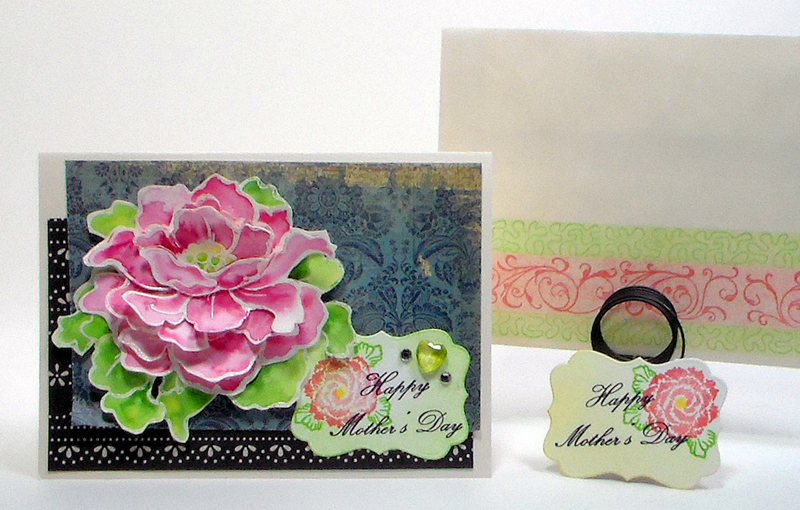 To make the layered flower stamped and clear heat embossed 5 flowers (Blossom Beauty from Stampendous) and painted 4 with pink and red and one with yellow and green like I showed in the video. 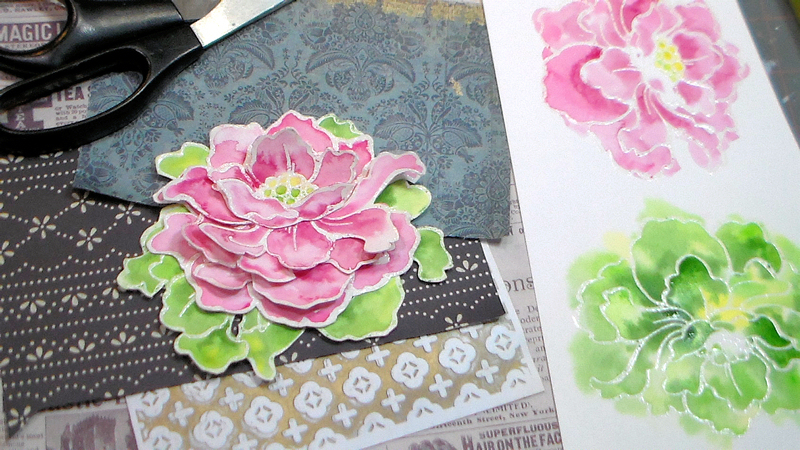 Then I simply cut out the flower parts and layered them. I used hot glue because it adds dimension. I thought it would be pretty on a mother’s day card. 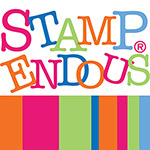 I just got some new stamps from Altenew and ink by Lawn Fawn and I thought it would be fun to try them out too. 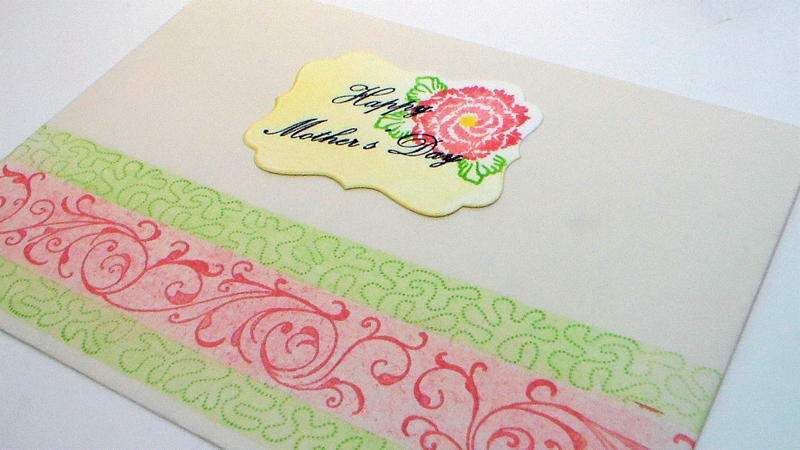 I will also show you a border technique using stamp wheels and masking tape. I used color dusters but you can use sponges if you want. Watch the video to see how! 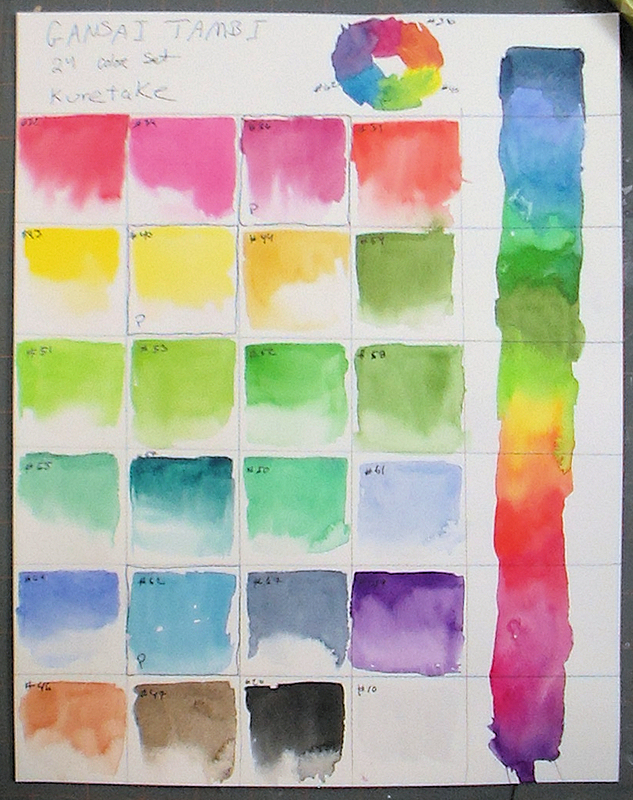 I hope this helped you make your mind up about the KURETAKE Gansai Tambi Water Color paints. 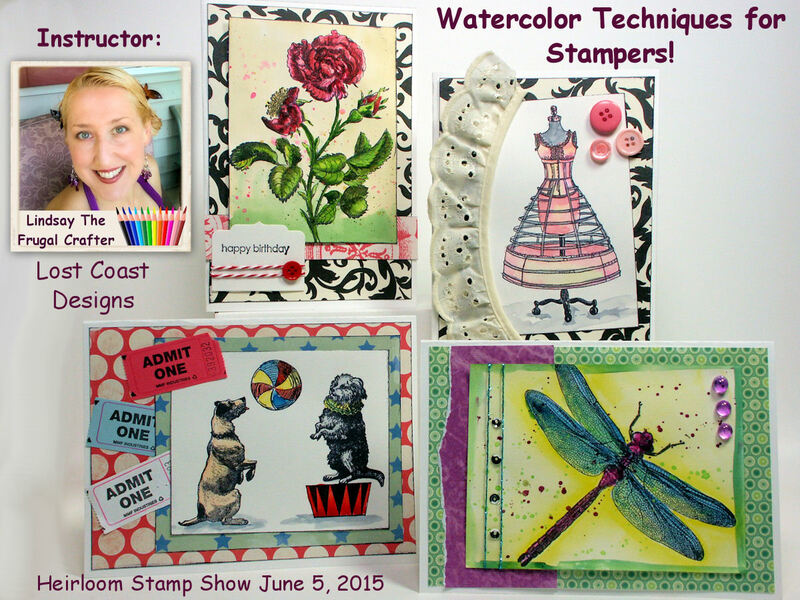 I also hope you try layering up some of your flower stamps. If you don’t have stamp wheels but want to try the border techniques just apply the tape first and stamp repeatedly with any stamps you have. Let me know what you link in the comments and til next time happy crafting! Classes are Open for Registration in W. Springfield! If you have crafty friends in the Northeast please let them know and help me spread the word. This is my first time teaching at this convention and I really want it to be successful! I will be attending the convention all weekend so if you are there shopping and you see me please say “howdy!” Here are previews of the projects we will make in the classes. 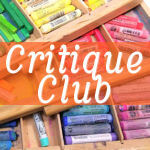 Each class is $35 and there is no overlap between classes so you can take them both (as long as there is still room!) I will provide the supplies for use in the class but I recommend bringing your own scissors and adhesive for the techniques class. Tip: if you are buying tickets and signing up for multiple classes be sure to click the back button after clicking on the class you want so you can have everything on one order (they charge a $1 processing fee per order) so you can save a few bucks and that means more money for stamps LOL! Class size is limited to 24 so please sign up early to be sure you will get a spot! 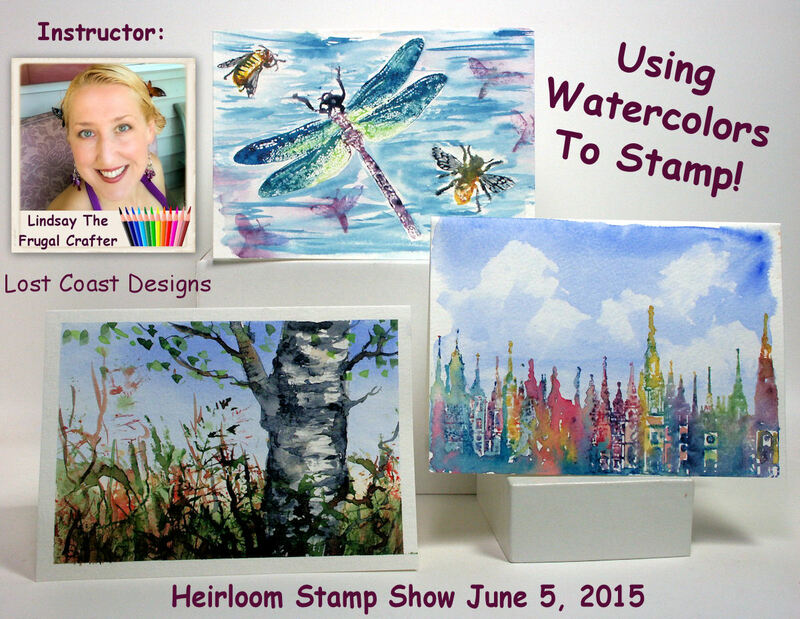 Check out the Heirloom Productions website to register, thanks for stopping by and til next time happy crafting! 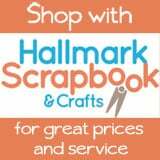 How to make business cards and craft fair packaging! I wanted bright colors but also a streamlined professional look. 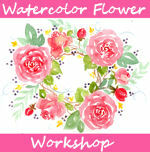 I decided to use some watercolor images from GraphicStock for my new branding. I know you are probably wondering why I didn’t just use my own paintings for this and that is a great question. I find it extremely hard to simplify my own work, I want to show more than is suitable on a small canvas like a business card and the end result looks amateurish and confusing. I wanted a really clean look with info on how to contact me for future purchases and where to find me online. For the packaging I wanted the price, my name and vendor number so I can use this for craft fair packaging as well as in my retail space which is a rented booth in a multi-vendor antiques mall. I don’t want to have separate packaging at different places. Also I used to hand stamp all of my jewelry cards and I just don’t have time for that anymore. Today I am going to show you how to create a business card from start to finish using an image from GraphicStock (but you can use any JPG or PNG file you want) and the steps are the same for making packaging, signs and tags. 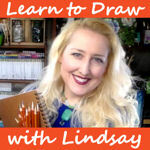 Feel free to follow along, take notes and pause the video when needed to follow along. 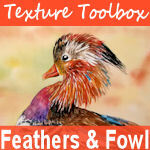 I am using Paint Shop Pro but you can use Photoshop, Gimp or other imaging editing software with similar results. Photo editing software-I am using Paint Shop Pro but you can use the software you prefer like Photoshop or gimp or any image editing software. 1. Download any images and graphics you want to use. 2, For a business card create a new 3.5″x2″ 300dpi document. 3. Copy and Paste in graphics and add text. Arrange elements until satisfied. Save this file in your software’s native format to make editing easier later on, then flatten and save as a JPG to use in the next step. 4. Make a new 8.5:x11″ document and copy/paste in the business card 10 times. Tip: set up a .5″ grid and use the snap to grid feature to help line everything up. 5. Flatten and print your business cards. You can repeat these steps in any size to create sheets of tags, labels and signage. Please visit our sponsor GraphicStock to get a 7 day FREE trial to download anything you want! 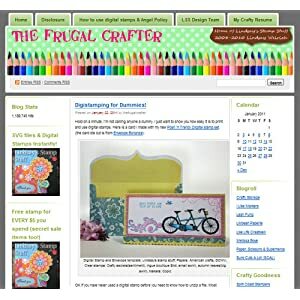 If you cancel your subscription within the 7 days you will not be charged but they are pretty sure you will find enough value that you will want to stay, it’s kinda like a Netflix for graphic lovers AND they have lots of lovely things for digital scrapbooking and hybrid crafting! Next week I’ll show you how to make the cute business card holder! Thanks for stopping by and til next time happy crafting!